I lost my job a month ago. The software company where I worked cut expenses to fit revenue. That’s business. I was Director of Quality Assurance. I built and led a team of functional testers, software engineers (writing code-based tests), and technical writers, and developed the strategies and processes the company used to test and deliver its products. It was a role my whole career had prepared me for, and I was glad to have it. But now I’m working my network, looking for my next gig. It’s been fun. I’ve spoken to a few dozen CTOs, VPs of Engineering, and even CEOs so far in my search, usually from startups and young companies. I’ve delivered so much software using waterfall and “scrum-fall” (the developers sprint, and testers try to keep up, but final testing still happens after developers are done) at various well-established companies that I thought that full-on agile was a myth, at least here in Indiana. 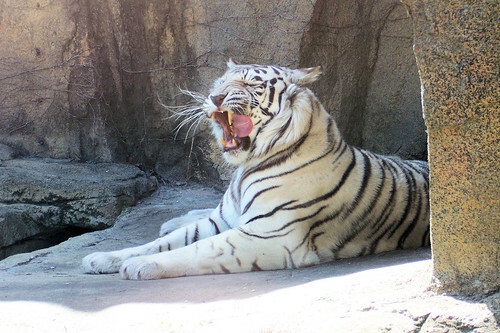 Endangered like this white tiger (who’s thinking about what you’d taste like). But the startup leaders tell me they’re all in: it’s agile, continuous integration, and continuous delivery all the way. And while all of them have or will soon need testers, they are all hedging on hiring specialized managers for them. When waterfall ruled the world, it made sense to have a QA department with its own leadership hierarchy. After all, the testers truly were a separate team with their own schedules, methodologies, and needs for care and feeding. But in agile, testers feel fully part of their scrum team rather than part of the team of people who test. I admit to some anxiety over this evolution, entirely because I’m unexpectedly on the job market after several years of being Manager and Director of QA. But I think these changes are good for quality software delivery. And these changes are creating opportunity, because there are things a good QA leader knows how to do that a CTO or VP of Engineering probably doesn’t. I networked my way into another startup CTO’s office just to introduce myself and ended up walking out with a short-term consulting job. It turns out that he’s ready to hire his first tester, but wants guidance on how testing should integrate into his team and how the tester should approach the work to find the most important bugs early. So I’m testing alongside his developers for now to get a feel for their context, and will develop a strategy and process his team can follow after I’m gone. In my conversations, over and over CTOs are telling me they need people to coach and guide on functional testing strategy and technique, or on building test automation and performance testing practices. One VP of Engineering I’ve talked to had an unusual take: that I should be able to help him build and manage his end-to-end software delivery process, including engineering and testing, because he sees process as key to predictable and reliable software quality. I certainly have experience in all of these areas. I imagine many Managers and Directors of QA do. I don’t want to count my chickens before they hatch, but I feel pretty good that at least one of these threads will lead to a full-time job soon. And with it, I’ll step out of the waterfall/scrum-fall past and into a present I previously didn’t know existed. It may well be that the role has shifted a bit. Having someone that has experience in test automation (including automatically deploying code so that testers can check features or bug fixes reasonably fast) and someone that can train in how to actually test and find the bugs seems quite essential to a working “agile” team to me. I think you’re seeing the same thing I am. Thing is, I don’t think that the automation leader or the test coach will be the person the testers report to and will not have a director/manager title. I think titles like “architect” will become more common for those roles, and they won’t have reporting responsibilities. I could be wrong; I’m trying to imagine the future here. But this is what it feels like is going to happen. That could be the case. I generally work in small startups that may not even have full time testers (yet) let alone many management roles so I can’t really comment on any of the reporting things. You seem to be looking for a permanent job. Otherwise doing exactly that could also be a possible career choice. That thought is percolating in the back of my mind. I’m anxious about starting a consulting practice (with uncertain paydays) when my son is about to start college — unlike in Germany, college is very expensive here! Maybe I should send him to Germany to go to school. Anyway, maybe I can do this after I get the college expenses paid for. I totally understand. I’m also currently employed because we just spent a lot of money on a house and the regular pay check reduces my stress quite a lot. You’ve inspired me to write up my thoughts on the role of testers in an agile (whatever that means) team: http://bettong.net/2015/07/03/why-every-agile-team-should-include-a-tester/ Man, I really need to practice writing!